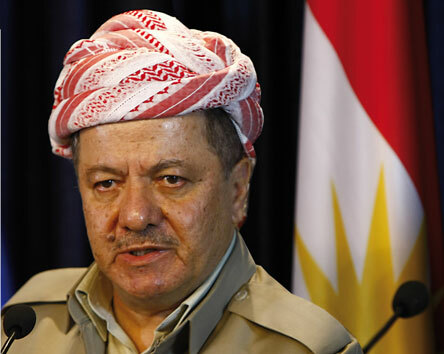 The president of the Kurdistan Regional Government, Masoud Barzani, has called for an immediate non-binding referendum in Iraqi Kurdistan over whether its people want to secede from Iraq and form an independent Kurdish state. A delegation from the KRG visited Baghdad yesterday, as well, headed by Barzani’s son. So the Baghdad government immediately said no to this referendum. But it could not offer any funds to Iraqi Kurdistan (because of the collapse of oil prices), and pleaded for the help of the Peshmerga in liberating Mosul from Daesh. No wonder Barzani feels in a strong position a the moment! In summer of 2014, after Daesh (ISIS, ISIL) took Mosul and detached northern and western Iraq from the rule of the Shiite-dominated government in Baghdad, Kurdistan Regional Government head Masoud Barzani called for a referendum “within 6 months” on the independence of Kurdistan. His argument was that his region no longer had a border with Iraq proper, only with Daesh, and that since Iraq de facto lay in pieces, the Kurds’ own aspirations may as well be achieved. US President Barack Obama appears to have prevailed on Barzani to put away those plans for a referendum, in return for US air support in the struggle of the Peshmerga (the Kurdistan national guard) against Daesh. We haven’t heard much about the referendum until Tuesday. It may be that Barzani now feels strong enough to buck the US (which is inclined to defend the national interest of allies in Baghdad and Ankara despite Washington’s close working relationship with the KRG). The US and Baghdad need the Peshmerga for the planned offensive against Daesh in Mosul later this year or early next, and perhaps Barzani is counting on being cut slack for that reason. Turkey is extremely threatened by the specter of Kurdish nationalism and separatism, since it has a large Kurdish population of its own in eastern Anatolia and could be dismembered by a South Sudan scenario. Iran is also worried about Kurdish separatism, since it has its own province of Kurdistan, where some 4 million people live. Damascus is too weak to do anything about it, but it too would be opposed to an independent Kurdistan. Syrian Kurds in any case say they want a loose federal state in Syria where their Rojava or Kurdish super-province would have substantial states rights. Al-Hayat points out that in recent years Iraqi Kurdistan has attempted to reinforce its semi-autonomy from the national Iraqi government via an oil pipeline through Turkey through which it can export petroleum independently of Baghdad. Al-Hayat says that Barzani’s critics are charging that his call for a referendum is a stunt whereby he is seeking to unite the very divided Kurds behind him. Barzani’s term as president actually ended last year, but no new elections have been held and he continues to cling to power.